Retreat to the charm and history of rural Cadiz. This 12-bedroom property welcomes you to a world of contemporary antique. Built just a decade ago from centuries-old and reclaimed materials, here you will find the epitome of Andalusian luxury, privacy and seclusion. Disengage from the world and explore the rural Cadiz countryside, foodie Mecca Vejer de la Frontera, and sunny southern Spain. 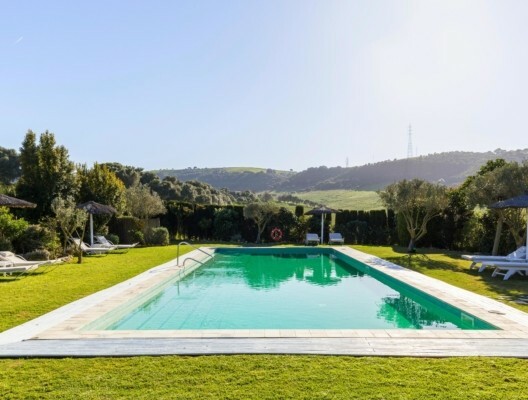 Hidden away in Cadiz, surrounded by rolling hills and grazing cows but just 10 minutes from the foodie hangout of Vejer de la Frontera, sits Hacienda Vejer. Exposed beams, Spanish roof tiles, thick antique doors, knobbly terracotta floors, an open fireplace. Every visual clue tells you that this stately hacienda has stood here for centuries. In fact, it was built just a few years ago: a labour of love, painstakingly built, piece by piece, from antique tiles, reclaimed lumber, heavy shutters, aged beams and centuries-old stone. The result is an intriguing hacienda, a country home and romantic retreat that couldn’t look more authentic, but that betrays its youth through details like luxury ensuite bathrooms, modern fixtures, and a professional kitchen equipped to serve a wedding celebration or banquet. Here you have a chance to escape from everyday life, to leave your cares at the door. Retreat from modern worries and technology; disconnect from work and the world. Meander through the rural countryside, where windmills spin and storks rest on telegraph poles, and discover some of the richest birdlife in Europe. Quench your epicurean thirsts in nearby Vejer de la Frontera, or with the villa’s own bodega and cook. 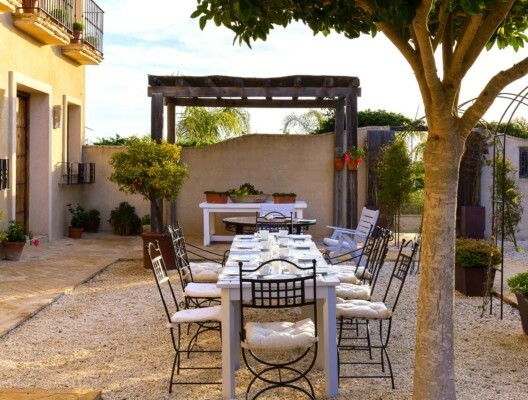 Delight in rustic, countryside Spanish life at this contemporary cortijo in stunning Cadiz. Natural light streams onto terracotta and wooden floors, illuminating ancient beams, deep sofas and luxurious bedding in this country home built for gatherings. Step into history in this rustic Spanish-style hacienda gone modern, with impeccable style and class. Shabby chic décor and antique materials beg second and third glances; double takes to appreciate the ancient terracotta floors and hand-hewn wooden beams. Here, you’re challenged to disconnect and truly unwind: there’s usually only one television on the property and WiFi is restricted to the main living space. Trade your screens for cushy sofas around the fireplace, for the pool within manicured gardens of lavender and kumquat, for long walks along miles of country road. The main home is comprised of six bedrooms, each with rolling hill views and its own private bathroom. The adjoining, New England-style cottage offers three bedrooms, one with ensuite bathroom and two that share a bath. A separate yurt offers one bedroom, great for the kids to camp out. Smaller families have the option to rent just the cottage, or just the main house. Each bedroom was designed with scrupulous attention to detail; no two are alike. Every night, you’ll retire to a rustic yet contemporary retreat, where the Spanish Cortijo style is present in every detail from the decorative antique floor tiles, to the eclectic assortment of European antiques. Luxury linens are standard, and you’ll enjoy relaxing on your own sun terrace, an amenity in every room. The Honeymoon Suite is the villa’s crown jewel. Accessed via thick antique doors from the courtyard, this romantic retreat opens onto impressive views over the pool and toward the hills. A plush king bed, freestanding roll-top tub, wood burning stove, twin rain shower and secret seating area add to the honeymooner detailing. Bathrooms pile on the charm with oversized showers and hand-thrown earthenware sinks on antique wooden surrounds. You’ll appreciate the luxury of heated towel racks, fluffy bathing towels, bathrobes, pool towels and organic amenities. The property’s dual living rooms, one in the main home, one in the cottage, promise plenty of space to stretch out, play games, and strike up conversation. Tall doors swing open to the main living room, where antique clay tiles are cool underfoot in summer, and warm in winter. Enormous sofas and reading chairs surround the fireplace, an atmospheric and cosy place where you can put the world to rights on cooler evenings. Morning sunlight streams into the attached dining room, to illuminate the aged breakfast table, with seating for 10. The cottage’s living room strikes a New England feel, with whitewashed wooden floors and walls. An open plan living space opens onto a dining table, modern kitchen and American-style veranda with picket fence. Back in the main house, the professional kitchen’s setup is designed for serious business. Whip up a gourmet feast for 10 or a wedding banquet for 120; both are easily accomplished here. Don’t worry about breakfast, though; it’s included: seasonal fruits, Spanish toast with virgin olive oil, and other fresh ingredients. Our chef is also available to cater dinners crafted from local ingredients, including fresh pickings from our own herb and vegetable garden. Let the Spanish sun warm your skin at two swimming pools, on the spectacular outdoor patio, and while you wander along peaceful rural roads. Look out the heavy, antique doors, past the streaming sunlight, and you’ll see a spacious Spanish courtyard. Part is shaded, part is open to the warm, southern Spanish sun. Sofas, tables and seating are sprinkled here and there, inviting you to sit down, curl up or stretch out. The patio overflows with herbs, kumquats, lavender and flowering climbers, trained to interlace with arched pergolas. Just beyond, the courtyard makes way for the main pool and the lush, green hills that climb into the distance. White windmills rotate gently in the breeze, storks stand guard on telegraph poles and cows dot the hills. Wile the days away at the property’s two pools, an 11-metre gem at the main house and a smaller pool at the cottage. Settle in for a relaxing massage under the poolside pergola or at the Yurt, or get active with a private yoga or tai chi session. Meet the Hacienda Vejer’s resident rehabilitated horses. Wander the grounds or step out for a walk along the quiet country roads that wind through the hillsides. This villa operates as a private boutique hotel on an exclusive basis, so there are staff onsite daily to serve breakfast and do light housekeeping. Additional services such as personal laundry, drinks service, babysitting etc can all be booked and paid for locally. 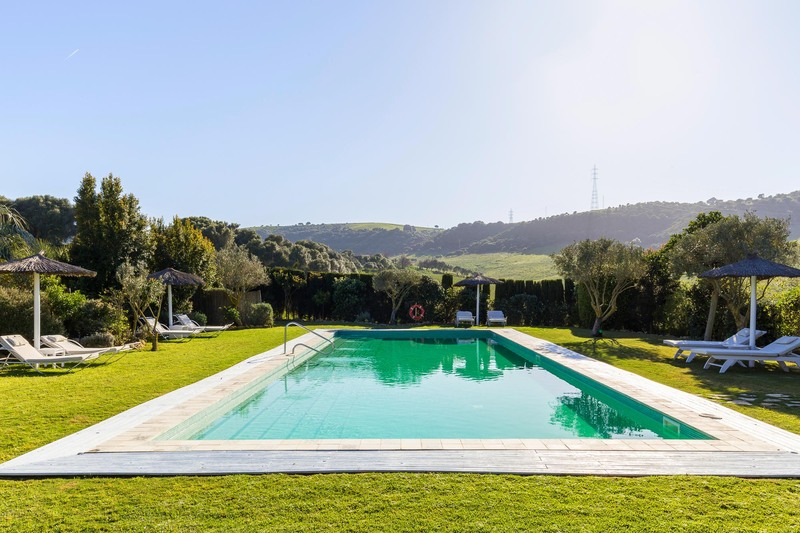 At Hacienda Vejer there is also a dedicated villa manager who can assist with extra services such pre-arrival shopping, wine orders, chefs, transfers, masseurs, nannies, etc. This villa is within easy reach of a whole range of amazing experiences to add to your travel memories. From cultural adventures to gourmet delights, we work closely with the best local suppliers to help make your stay extra special. Day tours and local activities can be booked directly with the Property Manager, or for the best availability for groups of more than 8 guests we recommend booking in advance with our expert tour guide partners. We are happy to welcome you with a light selection of local goods, compliments of the house. A more complete villa pre-stocking service is also available and can be paid on arrival, we can also stock the bodega for you with a hand-selected choice of local wines. The house staff will then take care of your initial grocery shopping before you arrive so you can get straight on with the job of relaxing. The staff are also on hand to serve and prepare your breakfasts daily, and the cook is available for lunch or dinner to prepare a locally-inspired menu with fresh fruit and herbs from the garden. We can also offer a poolside waiter service on request, and for more formal occasions we work with several professional chefs who can prepare a range of local or international dishes for you and your guests. To help you get the very best from your stay at this villa, you will find an information book inside the villa full of ideas for places to visit during your stay. You can also ask the villa staff for local recommendations, and they will be happy to help. If you wish to hire cars or transfers simply contact our Concierge before you travel and we will be delighted to help. The main house has a huge open-plan living room with squashy sofas around an open fire, the space flows to the dining room and opens out to courtyard gardens front and back. While in the cottage, there is a modern and cosy family living room, again open plan with the dining room and kitchen. Additionally, the bedrooms in the main house are spacious with their own cosy reading corner to enjoy an hour’s escape from a large group. The large reclaimed wood dining table seats 10+ guests at once indoors (extendable as needed), or there is a shaded outdoor dining area for summer months, which also has a BBQ and bar. Breakfast can be taken in the main house, or on one of the pretty patios outside and will be served daily by the house manager. The cottage also has a small indoor kitchen-diner and outdoor dining on the porch overlooking the pool. For small weddings we can lay out celebration tables in the central courtyard. This villa has extensive terraces and cottage gardens waiting to be explored. By the pool you will find a shady cabana for escaping the heat or enjoying a professional massage or beauty treatment, while the Yurt can be used as additional sleeping accommodation or simply as a space to meditate and unwind. There are poolside sun loungers with magnificent views across rolling countryside, or for a sociable evening with friends, the main chill-out terrace and courtyard provide a relaxing a welcoming retreat. Bedroom 1: Ground floor suite with wood-burner, King-size bed, free standing roll-top bath, shower, twin sinks, loo. Small terrace. Bedroom 2: Ground floor room accessed from courtyard. King-size bed, chaise longue, rain shower and free-standing bath, loo. Small patio. Bedroom 5: First floor room with King-size bed, balcony and pool views, shower (no bath), loo. Bedroom 6: First floor double room with King or twin beds, Juliette balcony overlooking countryside, shower (no bath), loo. Bedroom 8: First floor cottage, Juliette balcony, double bed, shared family bathroom. Bedroom 9: First Floor cottage. Master bedroom, King-size bed, en-suite shower room, dual-aspect views over main villa courtyard and pool. Bedroom 10 + 11: Brand new 2-bedroom apartment with living area, kitchen, bathroom, located in the grounds near the big pool. Some bedrooms have space for an additional camp bed for a child or a cot, please ask us for details. Hacienda Vejer is the very picture of calm and tranquility, capable of soothing your cares away and getting your shoulders down within minutes of your arrival – its quite possibly one of my favourite places in southern Spain! Hacienda Vejer is the star of our Character Collection, designed and built with exquisite reclaimed materials, characterful features and an air of the Andalucia of old. Large family groups will love the layout, consisting a 5-bedroom main house, 3-bedroom Casita with its own pool, and new 2-bedroom apartment sharing the main pool, meaning this Hacienda can perfectly accommodate large families and groups of friends in 10 separate bedrooms, 8 of which offer en-suite bathrooms. The bedrooms are well distributed to allow extended families their own space to relax and contemplate before coming together for good conversation and tasty local food, while children amuse themselves swapping technology for a game of hide and seek and the feeling of sunshine on their skin. Eco-friendly, the property is perfect for those who appreciate, enjoy and strive to protect nature. And for those who like to get even closer to nature, you can sit and quietly contemplate the stunning scenery, or peruse the garden to select herbs, vegetables and fruits to incorporate into your meals. This makes it an ideal venue for a private retreat or holistic break from daily life. Hacienda Vejer is a special treat for vacationers looking to truly get away from it all. With just one television and limited WiFi Internet, the focus here is not on technology but instead relaxation; to disconnect from the modern world, in order to connect with yourself, and with each other. Hacienda Vejer offers the space and surroundings to make your Spanish wedding dreams come true! This is a perfect place to enjoy your wedding in Spain, with expert staff on hand ready to help you plan all the details and deliver exactly what you want on your most special day. 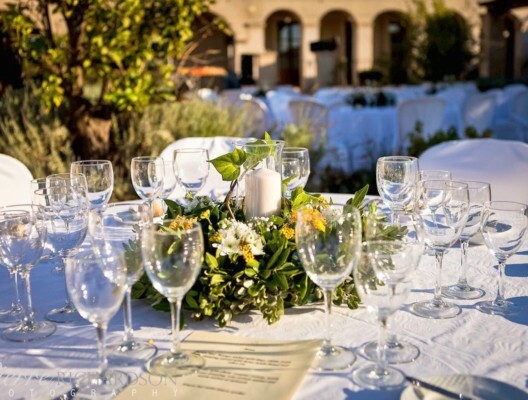 Celebrate your marriage with a blessing at the Hacienda, or enjoy a villa-based celebration after your religious ceremony in the stunning local church, located in the white hill top village of Vejer de la Frontera. The Cut off Time for the Music is 2am – There are no neighbours to worry about, and plenty of space so you dine and dance the night away under the Andalucian stars in beautiful Cadiz! To ensure the highest quality of service, the number of weddings accepted at Hacienda Vejer is limited to 10 per year so it is advisable to book early. A fee for the planning and organisation of your wedding and all of the elements needed to bring your dream day to life is charged additionally to the rental. Bespoke Wedding Menus available: Menu prices start at €155 per person and this includes a cava and canapes reception, wedding dinner and 8 hours of alcohol (usually 4 hours during cava reception and dinner and 4 hours of open bar during the party). We can also arrange any other events during your stay such as paella pool party, or bbq dinner, whatever you wish. The newly fashionable white village of Vejer de la frontera full of excellent restaurants and cafe’s is just 10 minutes away, while the nearest beach at El Palmar is one of the best in Spain. 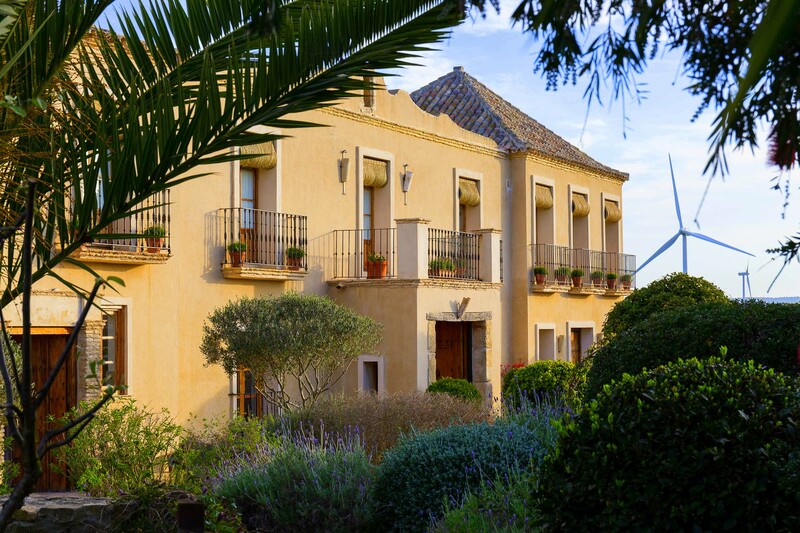 Hacienda Vejer combines rural bliss with endless options for a fantastic family day out! Vejer de la Frontera is one of the prettiest towns in the whole of Spain, gleams like Persil-white, sugar cubes or a ridge 200m above sea level. Cosmopolitan and yet steeped in tradition, it is easy to understand why bustling Vejer is the ‘Jewel in the Crown’ of the pueblos blancos in western Andalusía. Artisans peddle their wears to the wealth of visitors, whilst the restaurants vie for business with their mouth-watering menus and innovative locations – like Patria in the nearby, verdant oasis of La Muela. This restaurant has a small kids’ corner. For a day on the beach, its hard to beat the endless stretched of fine sand in Conil, such as El Palmar, while some of the most child friendly beaches can be found in Chiclana de la Frontera. There you will find a promenade dotted with play areas and beach bars or “chiringuitos” . Don’t forget the bucket & spade! Visit Cadiz, the oldest, continually inhabited city in Spain and possibly of western Europe. Sitting at the end of a narrow isthmus, surrounded by the Atlantic Ocean, Cádiz is understandably worth a least a day of your holiday time – with something for everyone to enjoy. The narrow streets connect into splendid plazas, sub-tropical gardens and a magnificent cathedral, Cádiz has several splendid beaches including La Caleta which served as the set for Cuban scenes in the James Bond movie – Die Another Day. In February, the city vibrates as it hosts one of the world’s greatest carnivals. Tarifa, within an hour drive. It is the wind and kite-surfing capital of Europe, where Africa meets Europe and the Atlantic meets the Mediterranean. This slightly bohemian port town bustles with the tanned and trendy enjoying the often brisk winds in the day and the laid-back nightlife once the sun has set. Popular with the children are the dolphin and whale watching boat trips, with all proceeds going towards the research and preservation of marine mammals. For a cultural twist, Tarifa is less than 45mins by hydrofoil from Tangiers – a popular daytrip for those wishing to sample the Moroccan hospitality. Seville, the stunningly beautiful capital of Andalucía and arguably one of the most picturesque cities in Spain, Seville is the ‘must see’ at least once during your stay. Seville captures the true ‘spirit of Spain’ and is a wonderful mixture of Roman, Muslim and Spanish architecture. The Alcazar for example, is a beautiful series of Moorish palaces, courtyards and gardens which rival the Alhambra in Granada whilst Seville’s Gothic cathedral, is the largest in Spain and retains the minaret of the mosque which it replaced. Seville is within an hour and half drive. Arcos de la Frontera is one of Andalusía’s most dramatically positioned pueblos blancos, straddling a rocky limestone ridge, its whitewashed houses and stone castle walls stop abruptly as the sheer cliff face plunges down to the fertile valley of the Rio Guadalete below. Justifiably popular with international visitors, the myriad of cobbled streets are some of the narrowest in Andalusía – not for the faint hearted!